Boost Mobile in association with Guerilla Union have announced the return of the ROCK THE BELLS 2012 FESTIVAL SERIES powered by BlackBerry. 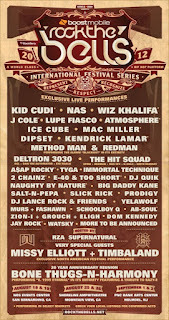 The world-class platform will feature an array of seminal and flourishing artists over an expanded two-day period in four major North American markets, including headliners Kid Cudi, J Cole, Wiz Khalifa, Atmosphere and more, with special guests Bone Thugs-N-Harmony. 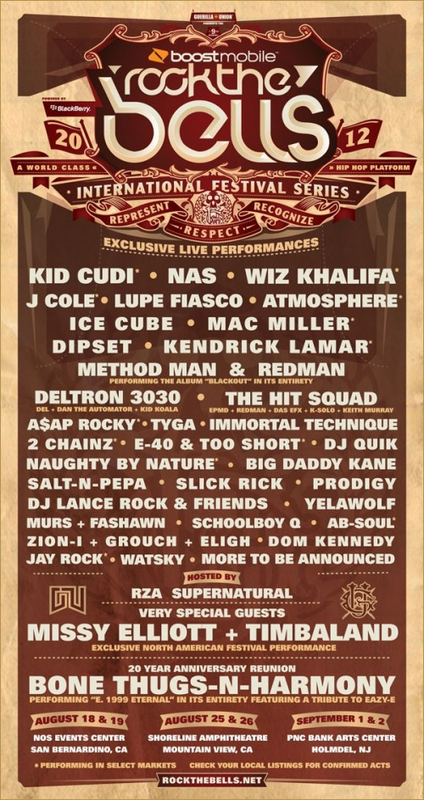 The only touring hip-hop festival will kick off in San Bernardino, CA on August 18 and 19 at the NOS Events Center. The festival will then make its way to Mountain View, CA on August 25 and 26 at the Shoreline Amphitheatre and will wrap on the east coast in Holmdel, NJ on September 1 and 2 at PNC Arts Center.